Many people express fear and anxiety over presidential elections. At times it seems like even people of faith are more Republican or Democrat than they are Christian. As Christ-followers, we must guard against fear and worry. Paul tells us, “Do not be anxious about anything, but in everything by prayer and supplication with thanksgiving let your requests be made known to God. And the peace of God, which surpasses all understanding, will guard your hearts and your minds in Christ Jesus” (Philippians 4:6-7). Don’t be fooled into believing that if your man or woman gets in the White House that this will somehow fix our problems and restore God’s will to the earth. Being over-concerned with election outcomes demonstrates a misplaced hope. Remember the words of the Psalmist: “Some trust in chariots and some in horses, but we trust in the name of the LORD our God” (Psalm 20:7). Nothing should detract us from the core mission: “Go into all the world and preach the gospel to every creature.” Being light in a darkened world is not accomplished through political lobbying. Our problems do not stem from poor legislation or immoral politicians. Rather, our problem lies in the human heart, which is deceitful above all else, and desperately wicked. The remedy is only found in the life-changing power of the gospel, not political maneuvering. If you wake up after the election and find yourself deeply disappointed, then my friend, you have too much hope in politics and not enough hope in Jesus Christ. If we are trusting in a president to change the sinful world we live in, we are guilty of “trusting in horses and chariots” rather than the Name that is above every Name. 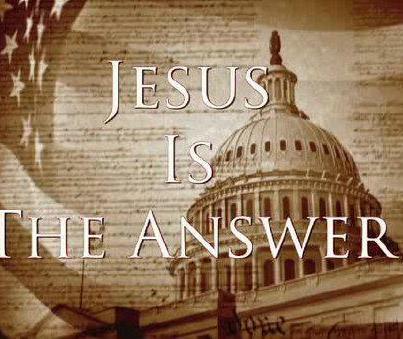 Remember, even if your guy or gal doesn’t get elected, God is still in control. Our hope lies not in an elephant, nor a donkey, but in the Lamb of God who takes away the sin of the world! Thank You. I’ll admit I am a little worried about today’s election results, but this puts things back into perspective for me.